Win, lose or draw against Switzerland tonight, it’s pretty clear that England have some work to do if they want to progress from their semi-final finish at the 2018 World Cup. 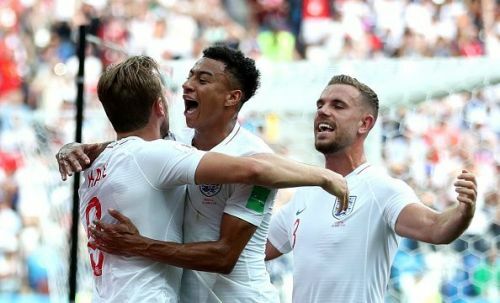 Beaten by Spain in their first UEFA Nations League fixture on Saturday, Gareth Southgate’s side once again displayed a lot of heart and tenacity, scored a great goal and never looked truly out of the game – but they also showed the same problems and holes in their game that they displayed in their World Cup losses to Belgium and Croatia. Southgate’s side clearly have a lot of potential, but here are three ways in which they could look to improve in order to become a truly elite international side. Ever since last November’s friendly games with Brazil and Germany, Southgate’s go-to formation for England has been a 3-5-2, with three central defenders, two wing-backs, a trio of midfielders – one holding, two attacking – and then two forwards. This tactic worked brilliantly in the World Cup – but only against weaker sides like Panama and Tunisia. That’s not to say England only defeated weaker teams. Colombia and Sweden – solid opposition by anyone’s standards – were also put to the sword, but against Belgium and Croatia, and again when faced by Spain on Saturday, England faltered. The difference between Sweden and Spain is quite simple, too – the latter side have midfield players capable of superior ball retention to their English counterparts. In essence then – only for sides capable of doing so of course – the blueprint to defeat Southgate’s 3-5-2 is written. Opponents push their own full-backs or wing-backs high up, forcing England’s pair backwards and essentially forcing the Three Lions into a 5-3-2 formation. From there they swarm the holding midfielder – most recently Jordan Henderson – and prevent him from linking with the attacking players, thus nullifying England’s threat substantially. It’s becoming clear now that against sides capable of doing this then, the 3-5-2 comes up short. And yet Southgate seems determined to push forward with a three-man defence, and thus far it’s worked well. So when faced with teams like Spain or Croatia, why not go with a 3-4-3 formation instead? This would mean the three-man defence and the two wing-backs remain, but one of the attacking midfielders – right now Dele Alli or Jesse Lingard – would be sacrificed for another central midfielder to provide support for Henderson and to prevent the forward line from needing to drop so deep, with the other moving into the forward line alongside most likely Harry Kane and Raheem Sterling.